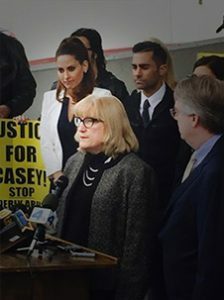 Martha received attention and press as the attorney who helped Kerri Kasem (Casey Kasem’s daughter) with her legal battle to see her father in 2014. Today, Martha serves on the board for the Kasem Cares Foundation, which helps spread awareness for elder abuse and adult rights representation. Martha is the sole reason I got to see my dad before he died. She was one of the lawyers responsible for overseeing the help with the Kasem children. Martha is a sought-after expert in elder law, and she really is the quiet giant! This woman really cares about the people she works with and is not in it just for the buck. I learned early on that life was full of challenges. My brother was killed in a car accident when I was 15, and ten months later, my father died of cancer. I went to law school to follow in my father’s footsteps, believing that lawyers help people. After all, our family had been helped by my dad’s lawyer friends when my brother and dad died. I spent the first 10 years of my practice as a successful litigator, winning a number of cases. I then discovered the field of elder law. Elder care law is an area of law truly dedicated to helping the elderly and disabled, as well as families who have special challenges. As an Elder Law Attorney, I have had the privilege of helping hundreds of families. The stress families feel when they come into my office disappears as I patiently explain the solutions available, and I provide them with the peace of mind that comes with the knowledge that my legal experience and education has enabled me to ensure that assets are preserved and loved ones will receive the care they need. I have been a trusted guide as families have struggled with placing loved ones in skilled nursing care. I have supported them as they took over the healthcare and financial decisions for loved ones who were no longer capable of taking care of themselves due to dementia, stroke, or another disease that robs a person of their mental abilities. I have been by their side as they guided parents facing a terminal diagnosis in planning for an adult child who would need assistance for the rest of their lives. I have helped many create estate plans that avoided taxes and fees at death, while making sure that if my client did not die, but lived with dementia, disability, or disease, that they would receive the best care possible while their assets would be protected so they would not go broke when they needed long-term care. I have been fortunate to be able to make sure that my mother could live at home, despite needing care at 90, and have been able to use my knowledge to make sure that – even though we had to go to court to fix her trust when it failed – she has the best care possible and that, when she needs the assistance of the government benefits available to those who need long-term care, she will be able to use these benefits without losing her assets. When you call me or plan a visit in my office, you will find that I understand your stress and pain, and that I have solutions to the challenges you face. My customized Legacy Protection Plans will provide you with the peace of mind of knowing that your assets will be preserved, and that no matter what challenges your family faces, I will be your personal legal advisor to make sure that the plans you make will be honored. My father, Joseph Brokaw Geisler, was City Attorney of Anaheim. He died of lung cancer when I was in high school, 10 months after we lost my dear brother in a car accident. I am the same age now that my father was when he died, and I doubt I will ever accomplish as much as he did in his short life. 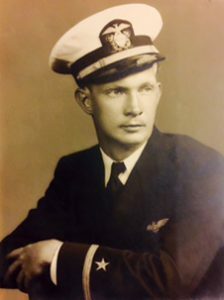 He served in World War II and earned two Navy Crosses and the Distinguished Flying Star, for his bravery. As City Attorney, he made the Anaheim Stadium and the Anaheim Convention Center a reality. He was known as a man who told you what you needed to know, not what you wanted to hear. I still remember when he received death threats for allowing the Hells Angels to hold a funeral procession down the main street of Anaheim, and how he became friends with Dr. Wilkerson because he did not allow the Walt Disney Company to forbid the Melodyland Theater from becoming a church across the street from Disneyland park. I hope I will always maintain my integrity as my father did, and that I will always tell my clients what they need to hear, not what they want to hear. 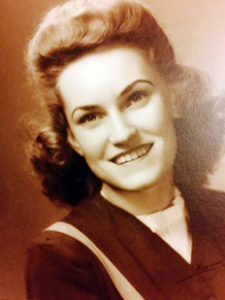 My mother recently passed away at the age of 90, and remains the most amazing woman I have ever known. At the end of her life, she wanted to stay in her home before we made the decision to move her to hospice care — a very difficult decision. What I loved about my mother was that, after my father died, she was strong enough to go back to work. She had the tenacity to learn how to operate the Mag Card II electronic typewriter, for, at that time, it was a highly desired skill among employees. She worked for the City of Anaheim, retired, and then worked for Poe’s Plumbing to complete her Social Security quarters. She has lived a frugal life and invested well thanks to her good friend Douglas Ogden. She has generously paid for my children to attend private Christian schools. I was able to make sure that my mother had a living trust that protected her while she was alive and protected her child and grandchildren after she passed. She was wise enough to purchase long-term care insurance through PERS when the City of Anaheim offered it. With her health failing at the end of her life, we were glad that she had this helpful resource so she could stay at home as long as possible. For several years, my husband – together with his brother and sister-in-law – had discussed their concern about my mother-in-law. She did not seem to be doing well. She was forgetting things, yet she denied that her memory was failing. My dear father-in-law did everything he could to protect her dignity and cover for the memory loss, so we did not know how bad things were until my father in-law fell and broke his hip. Like many people with dementia or Alzheimer’s disease, the severity of the memory loss is not apparent until some part of the fragile structure that enables them to function falls apart. My father-in-law’s injury was such an event. It became immediately apparent that my mother-in law could not be left alone, could not pay the bills, and could not care for her modest estate. At the time, my in-laws knew I was extremely busy with my career and my children. They did not want to burden me further, and, as they were out of town, had their living trust created by another attorney. Eventually, the family needed to review this trust. I became involved, but nobody could find the original trust or even a copy. Finally, we found a business card, and I contacted their estate attorney. He provided me with copies for a charge of $230. Part of my inspiration for creating my Trust Loving Care (TLC) maintenance program is based on the trauma we all suffered when we did not know who did the trust and where it was, as well as our resentment over having to pay for the copies. All of my clients are offered the opportunity each year to invite their trustees to meet with me, and, when they join the TLC program, their family is never charged for a copy of the trust or the call to me when their loved one passes away. After all, they, like my husband and brother, need to know what to do. I wish I could say that the stress associated with this event ended with finding the attorney and getting a copy of the trust. It did not. The trust itself failed. Why? The trust was 10 years old, and the successor trustee was my father-in-law’s best friend, who at 82 was just not able to do the job. My mother in-law could not change the trust, since it was obvious that she lacked the capacity to make legal decisions. Yet my mother-in-law believed that she was fine and did not want to see a doctor about her condition. We spoke to her primary care physician, who was more than willing to verify that she lacked capacity, but HIPAA prevented him from talking to another doctor, and like ALMOST EVERY TRUST NOT DRAFTED BY AN ELDER LAW ATTORNEY, this trust required two doctors to sign that she did not have capacity. So, despite the fact that it was obvious, we could not do anything unless we could get her to a doctor, and you cannot legally make someone go to a doctor. We ended up having to obtain a conservatorship of her person, and moved her to a secured memory facility. When my father-in law passed away, and the power of attorney my brother-in law used to pay bills was no longer valid, the trust failed again. Why? The bank had misinformed us, and their CD was not in the trust, so we now were required to account for her money in conservatorship probate court. All of this could have been avoided. Having seen firsthand the catastrophic results of inadequate planning, I am fully committed to making sure that my clients, and their families, will not have to go through what we did. To get answers for your own personal situation, please contact me today for a free initial consultation. A practical guide to help families facing the fact that a loved one needs full-time care. 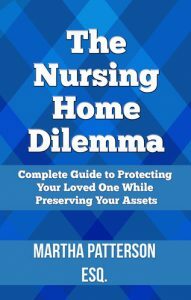 The book discusses the information families need to know when facing the dilemma of whether or not a loved one needs a nursing home, and explains the options available to pay for care without going broke. Order your copy today!